With another school year officially started, I am always on the lookout for quick and easy things to throw together for dinner after a busy day of running from one kid’s activity to another. I finally have one who is old enough to drive, which I am thrilled about, and that should help to lighten the load some. However, she is my first to drive and this causes gray hair, but that is a problem for another day! Back to quick dinners: I love to use this glaze on grilled meats. It has the wonderful combination of sweet and hot. The recipe will make more than you need for the Quesadillas, and it keeps well in the fridge. It is also yummy spread over a block of cream cheese for a quick appetizer. Don’t let the Chipotle peppers scare you away if you don’t like spicy foods. The combination of the peppers with the sweet peach preserves and BBQ sauce topped with melted cheese mellows it out. You can whip up the glaze early in the day, and when you get home dinner can be on the table in a flash! Heat 2 teaspoons vegetable oil in a medium saucepan. Sauté red onion for about 2 to 3 minutes until soft. Add garlic and saute for 1 more minute. Add peach preserves, chipotle peppers, lime juice, red wine vinegar, cumin, paprika, salt and pepper. Bring to a simmer over medium heat, turn heat to low and simmer for about 10 minutes. Remove from heat and stir in cilantro. Mix shredded chicken with the Chipotle Peach glaze, you will use about ½ to ¾ of a cup depending on how "saucy" you like it. Line a cookie sheet with foil (for easy clean up) and spray with cooking spray. Place 4 tortillas on the cookie sheet. It is fine if you have to use 2 cookie sheets you can just rotate the pans halfway through cooking. Top each tortilla with 1 tablespoon BBQ sauce and spread with back of spoon, not going all the way to the edge. Then top each tortilla with ½ cup of the chicken mixture and ½ cup cheese. Place remaining tortillas on top and press down firmly. Brush tops with softened butter. Bake in a 375 degree oven for about 15 minutes until tops are lightly browned. Quesadillas can also be browned flipping once in an skillet or on a griddle, and then kept in a warm oven while you cook the remaining Quesadillas. I prefer to bake them all at once so I don't have to mess with flipping them and I find they crisp up just fine in the oven. Let them sit a few minutes before cutting each Quesadilla into 6 wedges. You won't use the entire can of chipotle peppers. Line a cookie sheet with wax paper and place individual peppers with some juice in portions on the cookie sheet. Put it in the freezer for a couple of hours. You can then place the individually frozen peppers in a freezer bag. Just pop out and thaw however many you need! Also, the recipe will make about 1¼ cups Chipotle Peach Glaze. Any leftover can be used for dipping or it is yummy brushed on chicken or pork at the end of grilling. Oh my goodness! I’m so sorry it took me so long to make my way to your beautiful, tantalizing blog!! I can’t wait to get home and try some of these wonderful recipes. And I’ll share your site with my social media community at every opportunity! I’m so proud of you!! Oh My! These look delicious! Gotta love that sweet and spicy! How clever to use the peach preserves with chipotle. 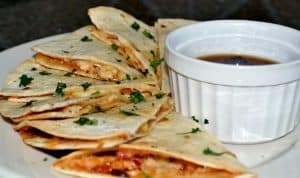 These are mouthwatering Quesadillas! Thanks MJ! I love the sweet and spicy as well! Like I said…the glaze in fantastic on just about anything! Have a great day!